Spectrem’s studies on the investment habits and attitudes of investors began segmenting investors by occupation in 2005. Among investors with at least $1 million in net worth (not including primary residence), the company studied investors who were professionals (doctors and lawyers), senior corporate executives and business owners. In the second decade of the 21st century, more Millionaires were coming from the field of information technology, and Spectrem’s studies began to track the investing habits of those investors. The addition of information technology to the studies proved valuable. Not only are there a great many Millionaires who became wealthy through their work with programming, computers and the internet, the people who are in that industry are younger and seemingly a bit more flexible as investors than those people in more normal occupations. Spectrem’s 2016 study on asset allocation and investor portfolios demonstrates how investors with an information technology background differ from the investors with whom they are compared: professionals, senior corporate executives and managers, business owners and educators. Advisors working with investors from the field of information technology should find out rather quickly that they are working with a different mindset of investors. The Spectrem research indicates the manner in which these investors differ from others. For instance, investors from information technology have a similar percentage of their assets as investable assets in comparison to investors in other occupations, but the information technology investors show a greater interest in alternative investments such as hedge funds, private equity, commodities and futures. This information can open up investment fields for these investors, who are likely to be younger than investors in the other fields and perhaps a bit more open to risk. It might not be surprising to find that investors from the field of information technology have a greater interest in investing in the countries of China, Japan and Korea. It is possible these investors work for firms from those countries. Even less surprising is that 65 percent of investors from the information technology sector say they would invest in technology if they had funds to invest. However, those same investors were ahead of the average in interest in health care, transportation and communications investing, all areas in which information technology plays a role. One other significant insight from the research is that a disproportionate percentage of investors from the information technology field consider themselves to have an active investment strategy. That is described as someone who moves in and out of investments depending on the economy, current investment performance and other factors that see frequent change. Are you in search of clients with investable assets who are ready to move into the investment game? Consider marketing yourself to investors from the information technology field. It is obviously where a great deal of income is being earned, and it is a field that creates wealth at a young, impressionable age when investors might be looking for their first financial assistance. 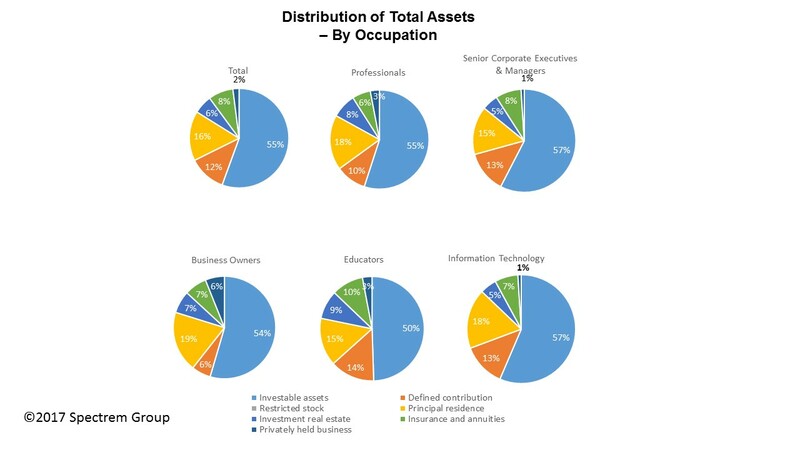 While the research into investors from specific occupations is not all-inclusive, the percentages indicate investors from the information technology field are “outside the box’’ thinkers when it comes to products and services. Keep that in mind when preparing recommendations for investors from that field.